I am always on the lookout for healthy, but easy to heat lunch ideas for my husband at work. Lately, my freezer is stocked with new Quinoa & Vegetable Enchiladas from CedarLane Natural Foods and it has been the perfect grab n' go lunch for my husband! With 12g of protein, 7g of fiber and 340 calories, these gluten-free enchiladas are a wholesome and delicious addition to CedarLane’s line of frozen meals. Each enchilada is packed with quinoa, black beans, Monterey Jack and cheddar cheese as well as roasted Anaheim peppers, tomatillos, corn, bell peppers, onions , mushrooms, yellow squash, black olives, and zucchini—all topped with a delicious Poblano Crema sauce. These enchiladas were delicious and even got the thumbs up from my husband, the pickiest eater in our house! :) He now has an easy to bring and heat lunch that has lots of flavor and lots of healthy ingredients packed into one meal! I LOVE THAT! 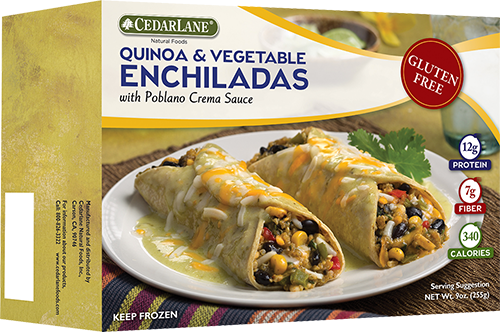 You can purchase Quinoa & Vegetable Enchiladas from a local retailer near you.